Roux – First, you make a roux. 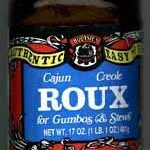 This is THE most important ingredient when making gravies, stews and gumbo. Just as a building must begin with a good foundation, without a good “roux” to start with, the final product is destined to be doomed!